Apologies for no show this week (Mugsy birthday preparation cannibalized all the free time), but wanted to take a moment and tell you about the #MoreThanWords campaign. Last year MTW raised over $5,000 for Chad Greenway’s Chad’s Locker program. 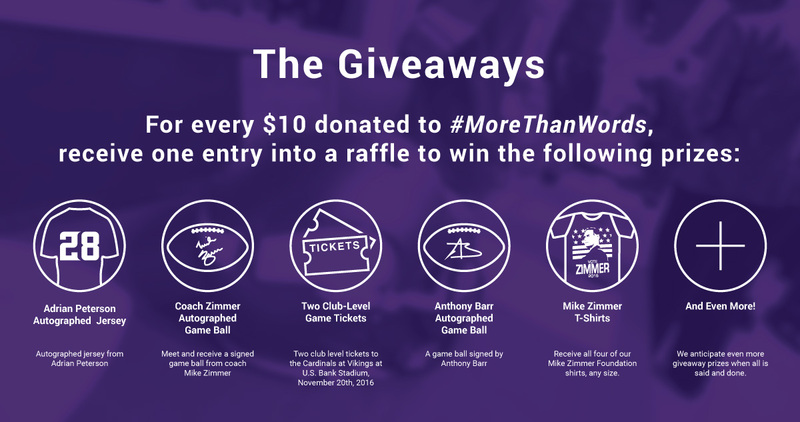 This time around, The Mike Zimmer Foundation is the target with a goal of $10,000 raised between June 1st and July 15th. Vikings Territory is spearheading the effort and The Daily Norseman, Cold Omaha, Vikings Corner, and yours truly are helping push the ball forward. Through the amazing generosity of the Vikings fanbase, we’re already nearly 20% of the way toward the $10k goal after only a few days. It’s a great start, but let’s keep on pushing. There’s also fantastic prizes being given away if you donate more than $10. Ten bucks? C’mon that’s a random lunch that’s bad for your waistline anyways. Giving is good for the soul. Donate today!